Start the school year off with these tips for a stress-free family dinner. They won’t only make your life easier and happier; they will also make it more delicious! I’m no stranger to the stress of making meals. Just because I have a food blog, doesn’t mean it always comes easy. Especially after a busy and exhausting day. With Ben’s long hours, an easy dinner time meal is even more important. I’ve learned, especially since having kids, some shortcuts and secrets to making things just a little easier come dinner time. I know I can’t be the only one that completely hits the wall when 4:00 rolls around! 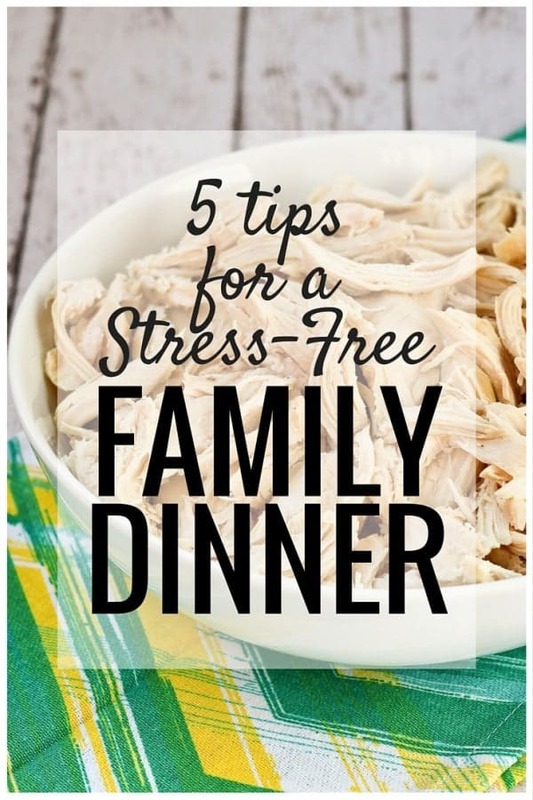 I’ve teamed up with Just BARE® Chicken again to bring you 5 tips to make that hectic dinner hour a lot easier! All it takes is flexibility and a little planning ahead. And great ingredients, duh. Do Meal Prep on Weekends. I find that when I have a stocked fridge of already prepared ingredients and food, I am much less likely to default to carry-out or delivery. I almost always boil eggs, wash greens, and cut up some fruit and vegetables. I also like to cook chicken to have available for quick and easy meals. When I’m doing meal prep, I like to roast split chicken breasts and then shred them. 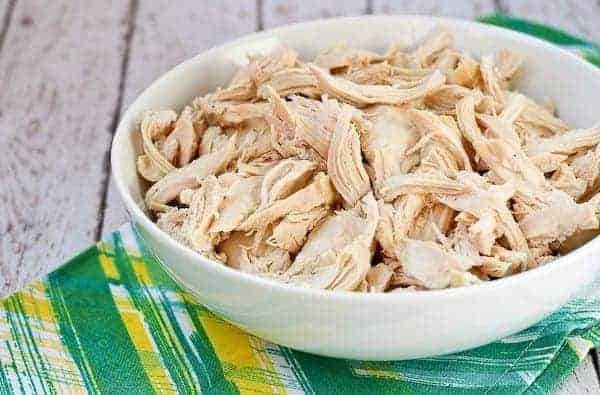 You can use the shredded chicken to make meals through the week or you can prep a big salad to keep in the fridge for lunches. If you devote even an hour or so to meal prep on the weekends, you’ll be amazed how much stress it relieves throughout the week. Pop some chicken in the oven and while it cooks, boil eggs and prep fruits and vegetables. By the time the chicken is done cooking, you’ll have tons of food prep completed! This is one of the best things you can do for yourself during a busy week! All you need to do is get up 30 minutes earlier (less if you did some meal prep! 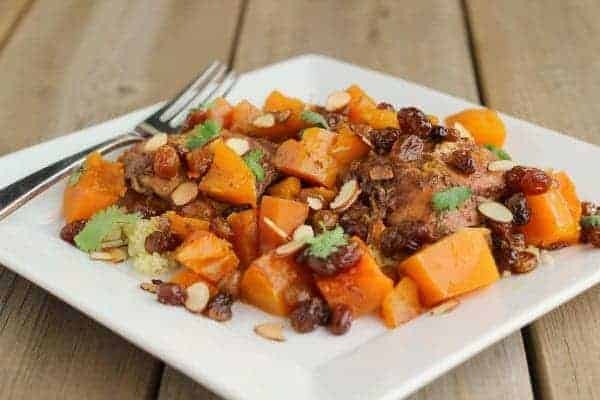 ), throw ingredients in the slow cooker, and then it’s ready and waiting for you when you get home. The great thing about chicken is that even boneless skinless breasts stay super moist when you make them in the slow cooker. When we grill, I always have Ben grill extra. It can be used for a dinner the next day or it can be chopped up and thrown on top of salads. Or, you can dice it and use it in a chicken salad. 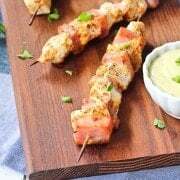 I’ve been using this chicken marinade all summer long – I’m obsessed. Soups and stews also lend themselves to large batches. 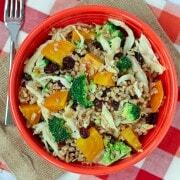 Try Chicken Barley Soup with Kale and Butternut Squash or Harvest Chicken Bean Soup with Herbal Oil. Don’t be afraid to change up leftovers – make them into a whole new meal! Some people hate leftovers. I understand! It can be boring to eat the same thing two nights in a row. I always try to use my imagination and come up with some way to transform my leftovers. An easy example is a taco dinner. With the leftover taco meat, I’ll make Mexican pizzas by spreading tortillas with beans and meat and topping with cheese. Bake them for 20 minutes or so and then top with the taco toppings you have leftover. Or you can make Mexican lasagna. Spread salsa in the bottom of a baking dish, top with a tortilla, beans, cheese and meat. Then add more salsa and repeat the process until you have beautiful “lasagna” layers. Bake until bubbly and heated through. Once again, top with taco toppings. Dinner is served, and SO not boring. The only limit here is your creativity! Soups and salads lend themselves really well to being made from leftovers. Don’t be afraid to keep things simple and fun! Dinner doesn’t have to be difficult. 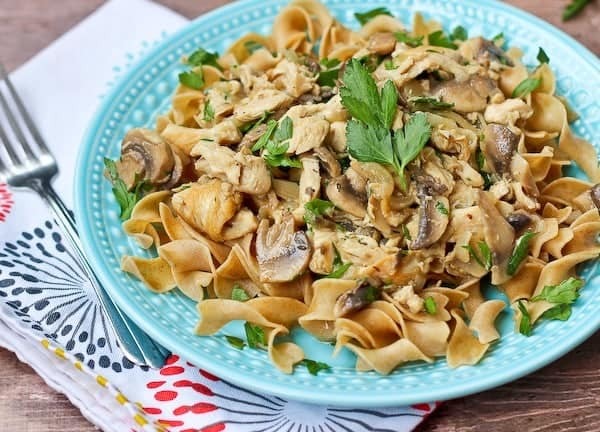 We love this healthy chicken stroganoff. It’s ready in 30 minutes, it’s healthy, and everyone loves it. One of the keys to keeping things simple and fun is to start with flavorful, fresh, quality ingredients. I’ve found Just BARE chicken to be one of my standby quality ingredients. We grilled it when my parents were visiting a few weeks ago and my mom just raved about the taste of the chicken. When you use quality ingredients, it shows. Even better is a brand that gives back. The brand lives its mission of raising goodness by providing good food for more people to fuel passions and a healthier future. A new and exciting away that Just BARE is raising goodness is through Goodness for Gardens, a program that benefits eight community gardens. 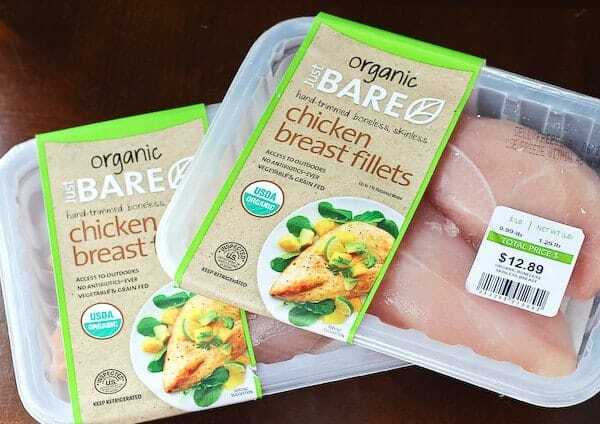 By purchasing specially marked packages of Just BARE chicken now through September 22nd, 2015, you can choose a community garden to which Just BARE will make a donation. Each garden will receive a minimum of $1,000 with a chance to earn up to $5,000 based on consumer participation! Head over to JustBareGives.com for more information. You can find more chicken inspiration on Just BARE’s Facebook, Twitter and Pinterest pages! You can also read more on Just Dish (their blog), The Good Plate (fun extras on healthy living), and of course on their website. These are great tips! I can’t wait to try your chicken barley with kale soup! I already pre cut potatoes needed during the week, but I’m going to start prepping the meat too! These are such great ideas! 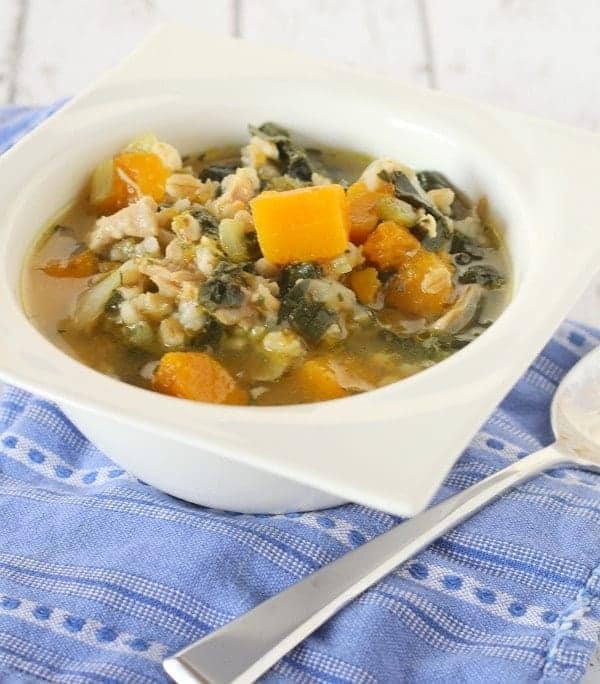 Now that it’s getting cooler outside, I can’t wait to try your chicken barley soup with kale. I like to cut up big batches of potatoes, diced or into fries. 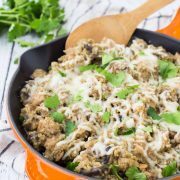 It saves me so much time making dinner, especially since a lot of my recipes call for them!